When it comes to travel blogging, that being what I endeavor to do here on this lowly online journal, I find that it becomes very hard to write when I have a large ensemble cast. This is the reason I have not (yet) put anything on here regarding our time in South Korea – because we stayed there with lots of family. Understandably the people I travel with might have reservations about being featured in the blog. I have the same issue with our time in Chamonix, as we were there with as many as 9 family members. Additionally, a lot of what I write is observational (i.e. guess what this idiot did?!) and when I am on holiday with a large contingent of family members I spent more time interacting with them and less time watching what some fool is doing on the street somewhere. Of course family members could possibly fill the fool role quite well, in which case I definitely can’t write about it. I have the same problem with photos. I need to speak to every person in every photo I use and ask them a) if they mind having their lovely image in the blog and b) is the photo in question acceptable to them. The upshot is that I can’t be bothered with all that. Luckily any talent less camera toting fool can take awesome photographs in the French Alps so I have no great concerns on that front really (he says, setting himself up for a fall). It is also quite notable that we aren’t really cold country people. 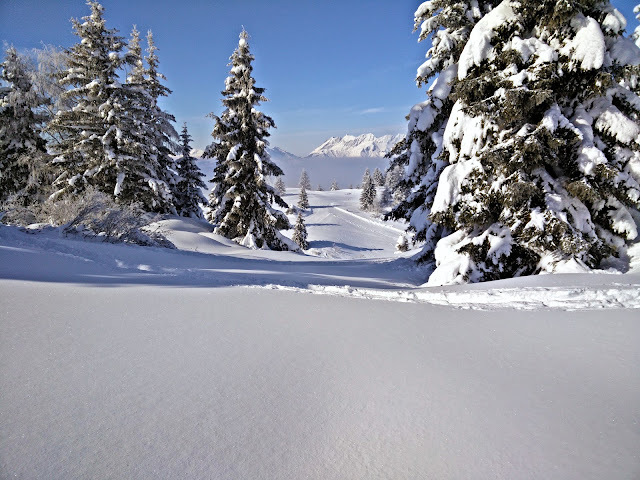 If you read this blog in its entirety, which would be a great idea if you were bored and slightly mad (I estimate it to be about 120,000 words so far), you would only find us in snow three times. Once in Bolivia when we had a really short snowball fight at high altitude, again in Bolivia at the start of Death Road and finally when we drove up to the base of Mount Cook in New Zealand. Apart from that it’s all beaches and jungle and sunny cities and sweaty buses. But anyway, enough rambling. 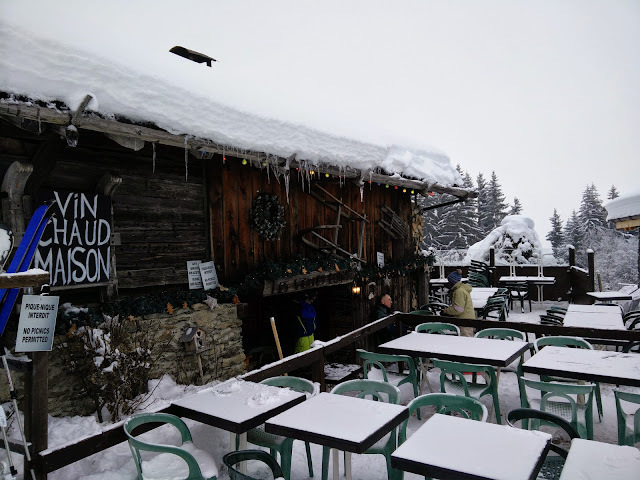 Let me tell you about our first winter experience in Chamonix. The ancient art of snow shoeing. 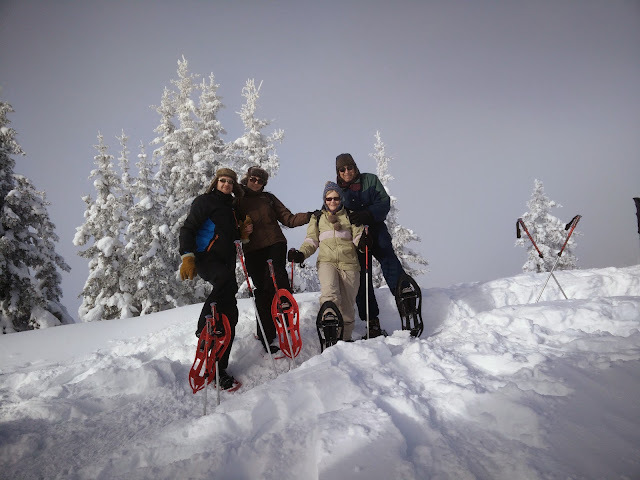 We set off on our first snow shoeing expedition with Claire’s parents, who are both newly retired and have an adventurous spirit that can not be doubted. Our guide for the day was all action Frenchman Jean-Marc, who is living proof that mountain air is good for the health (and the patience). I rarely go into such adventures naively but in all honesty I had visions of being handed two tennis rackets to strap to my shoes. Fortunately technology has moved on since the tennis racket days. 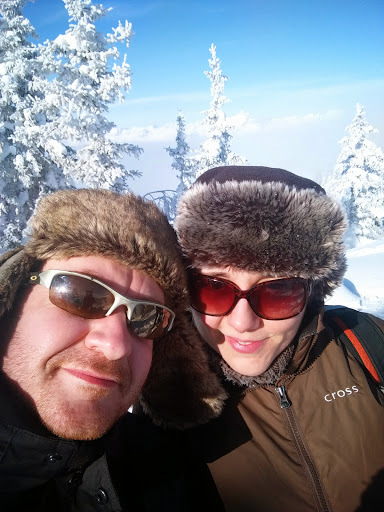 After we had reached the top of the mountain on a ski lift we then set about strapping the very fancy looking lightweight plastic snowshoes, complete with some really vicious looking metal spikes, to our feet. Additionally we had snow poles for extra stability. Upon setting off a I promptly fell over. It wasn’t as easy as it looked. Snow shoes do not stop the wearer from sinking into the snow, but instead they lessen the amount of sinking by dispersing weight. They work, but there is a technique to them and my first mistake had been to stand one snow shoe on the other and try and walk. The Team for the day. The rest of the family were not man enough to snow shoe and instead went skiing on something called a “black run”…whatever the hell that is. Once we had all shown a little aptitude for the simple act of putting one shoe in front of the other Jean-Marc took us away from the skiing area and into trees at the very top of the mountain. The snow was deep and the terrain was very up and down and again we all started to fall over. Fortunately deep slow is a great place to land, unless you didn’t do you coat up properly. I should probably point out that Claire had kindly brought my snow gear with her so I was not so stupid to venture into the deep snow in the lightweight summer jacket. Our first test, which was soon to become extremely relevant, was to descend a steep slope. Jean-Marc explained the technique, which was to essentially dig our heels into the slope in order to almost create steps into the snow. I got the hang of this immediately and got up a head of steam but then collapsed head first down the slope when I sunk into a bush which was hidden under the snow. Claire and her parents were faring much the same, mostly looking capable before being undone by deep snow, or hidden objects like bloody great rocks or fallen trees. I told you any idiot could take decent photos in the Alps. Note the layer of cloud above the valley and then mountains in the background. Despite lots of falling over the first “walk around in a circle” bit was brilliant. The scenery was amazing and promoted a real sensation of being isolated and the snow we were walking through was undisturbed aside from some animal tracks. The fact that the ski lift and a few hundred skiers were only a few hundred metres away was something we forgot very quickly. On the way back to the ski lift we had to climb a steep hill. To do this we had to drive the front of our shoes into the snow, so pretty much the same technique as descending but in reverse. Again this went mostly well but then just as complacency set in something would go wrong. The falling over was fun, but also tiring as getting back onto your feet whilst wearing snow shoes is hard. By the time we got back to the ski lift we we were all starting to feel the strain. Claire’s back! And so are my “round the world” sunglasses. Though we had to get further down the mountain to meet the rest of the family for some lunch the ski lift was in fact nothing but a landmark. Instead we descended on foot. The route was well trodden but steep, twisting back and forth to lessen the steepness. Falling over became normal as Jean-Marc started to look like a man who wished he were somewhere else. I found that descending quickly on the steeper sections was more effective around 80% of the time, and the comical falls that resulted when things went wrong actually helped to liven things up. I was getting cold though as the snow was gradually getting further and further into shoes, up my jacket and in my gloves. Falling and sinking into a deep snow arse first is never really ideal. Our often calamitous efforts were made all the more laughable by the fact that many skiers passed us whilst they were skiing UP the hill that we were falling down. Eventually, after what seemed like hours, we reached the restaurant. As I ate the best beef bourguignonne I have ever tasted I concluded that snow shoeing is great. What I didn’t realise is that this was just a taster and I was yet to experience real snow shoeing.